Brexit image by Stefan Schweihofer (Pixabay). 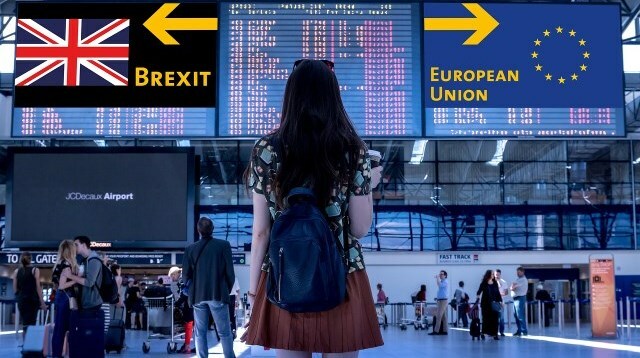 According to a recent article by the BBC, the level of net-migration from within the EU has continued to decline since the Brexit referendum from a peak of over 100,000 to 74,000 in 2018; the lowest number recorded within the last six years. Since the Brexit vote, uncertainty on future visa status and dwindling job prospects has contributed to a short-term decline in EU migration (IPPR think tank, November 2017). These numbers are still much higher than the government wants, according to a recently introduced white paper that aims to introduce a skills-based migration system with the promise of controlling the number and type of people coming to live and work in the UK (White Paper, December 2018). These proposed set of regulations mark a stark contrast with current policy for citizens from the European Economic Area (EEA), but was largely expected from a government that has argued that migration needs to be cut to less than 100,000 a year from all countries from the current level of 261,000. While past migration research can’t tell us how future migration laws will change in the wake of a constantly-shifting Brexit, it can give us hints on what impacts skill-based enforcements may have on future migrant flows from the EU. We are currently living in a critical juncture where current public opinion will shape migration policy and the face of the U.K. for decades to come; making understanding what the research says about such a system ever more important (Global Council, January 2017). Both the current government and researchers alike agree that migration is key to modern labor markets. With almost 850,000 job vacancies (The Guardian, November 2018) and 70% of businesses struggling to fill position in the UK, politicians believe a strict skill-based system will be able to both attract what they see as highly skilled migrants and reduce other forms of migration by putting EEA citizens in a temporary migration track. How can this new system be expected to change migration from the European Union? Dichotomizing jobs into skilled or unskilled categories, such as with the government’s proposed £30,000 minimum level of household income for EEA citizens, which is well above the level of median income in the UK (Office of National Statistics), is an imperfect science that may falsely count jobs as unskilled. The idea of what constitutes a “skill” is regarded by researchers as a vague concept that changes over time and depends greatly on what the society currently constructs as important, making it very difficult for the government to keep updating what it believes the economy needs (Anderson and Ruhs, 2010). For instance, many key positions in the health sector have starting wages below the £30,000 mark, leaving the NHS to state their alarm at the measure which may make it difficult to hire nurses and other care professionals from abroad (Lexology, December 2018). With the UK economy not only needing doctors but also fruit pickers, machinists, lorry drivers and sales representatives, using such a skill-based system will likely further discount the importance of many soft skills that are vital to interacting with customers and running successful businesses in the UK (Newscabal, August 2018). Point-based systems have also been shown to disproportionately impact women and other minority groups who may have histories of unpaid care work or informal employment (Kofman, 2018). For those EEA citizens who do not fit the high-skilled category under the new white paper, a separate track will be created for short-term employment with no rights of obtaining services, extending the visa, or bringing family members into the UK (White Paper, December 2018). The goal of this track would be similar to guest-worker programs which bring workers in for seasonal or temporary employment with few rights and then send them back to their country of origin. While such programs have shown success in the past, conditions in the UK suggest that the issue of getting designated low-skilled EEA citizens to return to their countries of origin after their short term visa expires could be very problematic (Basok, 2000). First, the importance of interest groups needs to considered. The White Paper concedes that many UK businesses have already become dependent on cheap EU labor, which means that these organizations have a strong interest to keep their trained workforce rather than rotate new untrained workers into the country each year. Organizations with such a strong interest in low-skilled EU migration are key to both shaping any final legislation and helping (or helping avoid) its implementation. Research shows that such concentrated business interests have historically been able to successfully organize against less-coordinated anti-immigration advocates (Massey et al., 1993); with recent votes in parliament exemplifying divisions in the pro-Brexit movement. While the White Paper argues that the temporary route will be closely monitored and available only for certain-low risk countries, similar programs in the U.S. as well as in other countries have shown the difficulty of strict enforcement in guest-worker programs (Basok, 2000). Another example of the importance of interest groups comes from the soon-to-be both fast tracked and limitless number of high-skilled visas, which are currently capped at only 20,700 (Lexology, December 2018). Creating a limitless number of visas for a white paper that argues of the importance of controlling migration may seem contradictory without considering business interests. Next, short-term migration restrictions often fail to see migration as a social process and therefore how migrants utilize their social connections to avoid enforcement (Castles, 2004). Rather than isolated individuals who respond only to wages or restrictions, migrants utilize social networks and connections to better shape economic outcomes. With large groups of migrants from the EU already settled in the country, new migrants will find that they have lower opportunity-costs of remaining in the UK compared to newly established nationalities (Massey et al., 1993). These migrants could use their social capital from their relationships with fellow EEA migrants, UK citizens and from the numerous migrant community organizations around the UK to help circumvent tight restrictions on their stay in the UK (Thieme, 2006). Recent research on migrant social capital has continued to show the strong value of social capital for migrants and refugees in their new countries both in finding economic well-being as well as resources such as housing and accessing services (Malik et al., June 2017). Lastly, before a large-scaled temporary migration scheme is developed for the UK’s neighbors, the moral considerations should also be considered of making EEA citizens, many of whom grew up only a bus ride away from London, leave their occupations and lives behind in the UK every year, as well as to live in the country with few rights or services (Carens, 2008). These regulations will likely greatly increase the number of individuals living in the UK without authorization from its currently high numbers (of which, no accurate counts exist); creating a new class of individuals living in the country with little stake in the future of the UK. Migration research on how migrant skills are socially constructed, client politics and the importance of migrant social capital can all help us understand what impact new migration regulations after Brexit may have. Yet our limited understanding of how these and other concepts fully influence migrant flows means that policy can be created without a full understanding of how these factors influence the migratory process; leading to detrimental outcomes for both migrants and host-countries alike. Funding new rigorous migration research to increase our knowledge base on how migration flows operate in country-specific contexts can help us create policies that support both migrants as well as the citizens of the UK. Shaw, D., 2019. UK migration: Rise in net migration from outside EU. BBC News. Available at: https://www.bbc.co.uk/news/uk-47400679?intlink_from_url=https://www.bbc.co.uk/news/topics/cz4pr2gdg1et/migration&link_location=live-reporting-story. Morris, M., 2017. Brexit uncertainty driving EU migrants without 5 years’ residency out of UK, says IPPR. IPPR. Available at: https://www.ippr.org/news-and-media/press-releases/brexit-uncertainty-driving-eu-migrants-without-5-years-residency-out-of-uk-says-ippr. Secretary of State for the Home Department, 2018. The UK’s future skills-based immigration system. Allen, K. & Smith, T., 2017. Analysis. Brexit and the future of UK immigration policy | Global Counsel. Available at: https://www.global-counsel.co.uk/analysis/insight/brexit-and-future-uk-immigration-policy. Wearden, G., 2018. UK unemployment: Vacancies at record high as EU workers leave – as it happened. The Guardian. Available at: https://www.theguardian.com/business/live/2018/nov/13/deadline-italy-2019-budget-uk-unemployment-markets-business-live. Marshall, A., 2018. Britain can’t wait any longer for a post-Brexit immigration policy | Adam Marshall. The Guardian. Available at: https://www.theguardian.com/commentisfree/2018/aug/23/britain-post-brexit-immigration-policy-white-paper. Anon, Average household income, UK: Financial year ending 2018. Office for National Statistics. Available at: https://www.ons.gov.uk/peoplepopulationandcommunity/personalandhouseholdfinances/incomeandwealth/bulletins/householddisposableincomeandinequality/yearending2018. Ruhs, M. & Anderson, B., 2010. Who Needs Migrant Workers? : Labour shortages, immigration, and public policy . Oxford Scholarship Online. Moseley, J., 2018. Immigration: White Paper sets out post-Brexit rules for employing migrants. Lexology. Available at: https://www.lexology.com/library/detail.aspx?g=82034727-6cc8-4679-bc65-fdf5768d0c1a. Marshall, A., 2018. Britain can’t wait any longer for a post-Brexit immigration policy. Newscabal. Available at: https://www.newscabal.co.uk/britain-cant-wait-any-longer-for-a-post-brexit-immigration-policy-adam-marshall/. Kofman, E., 2018. Family Migration as a Class Matter. International Migration, 56(4), pp.33–46. Basok, T., 2000. He Came, He Saw, He Stayed. Guest Worker Programmes and the Issue of Non-Return. International Migration, 38(2), pp.215–238. Massey, D.S. et al., 1993. Theories of International Migration: A Review and Appraisal. Population and Development Review, 19(3), p.431. Castles, S., 2004. Why migration policies fail. Ethnic and Racial Studies, 27(2), pp.205–227. Susan Thieme. 2006. Social Networks and Migration: Far West Nepalese Labour Migrants in Delhi. Münster pp. 49-56. Malik, A. et al. 2017. Mapping the Structure of Well-Being and Social Networks of Refugees. The Urban Institute. Carens, J. H. 2008. Live‐in Domestics, Seasonal Workers, and Others Hard to Locate on the Map of Democracy. The Journal of Political Philosophy.